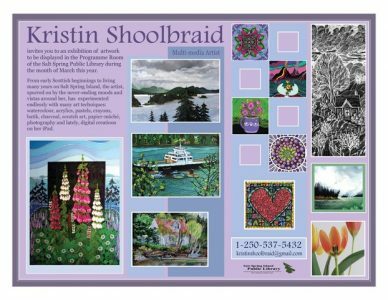 If you are interested in having a month long exhibition of your art in the library program room or display case, please download, complete and send an Art Exhibition Proposal to the Library Art Coordinator art@saltspringlibrary.com. 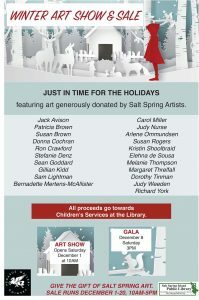 Winter Art Sale featuring art generously donated by local Salt Spring artists. 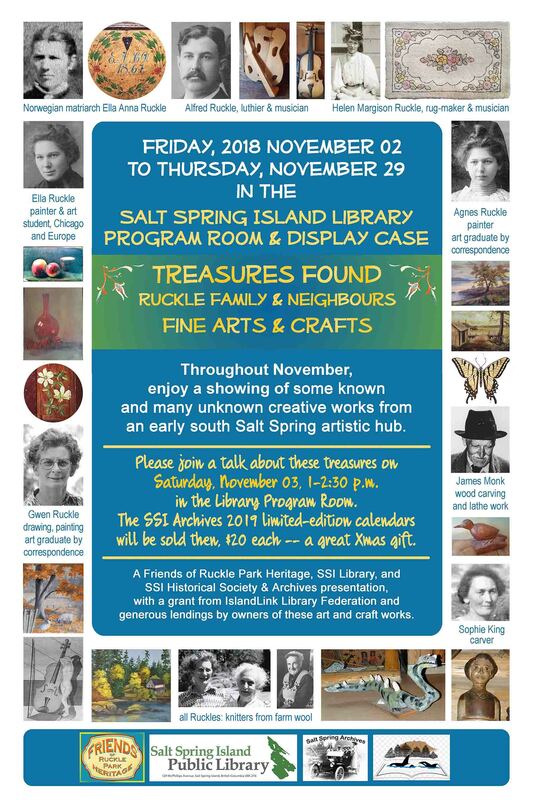 Historic Fine Arts & Crafts by Ruckles and Neighbours, Brenda Guiled, author of Ruckles’ World: a History of South-East Salt Spring Island, presents a PowerPoint to launch the month-long display of decorative and useful items made to enrich the lives of early south Salt Spring farmers and their kin. 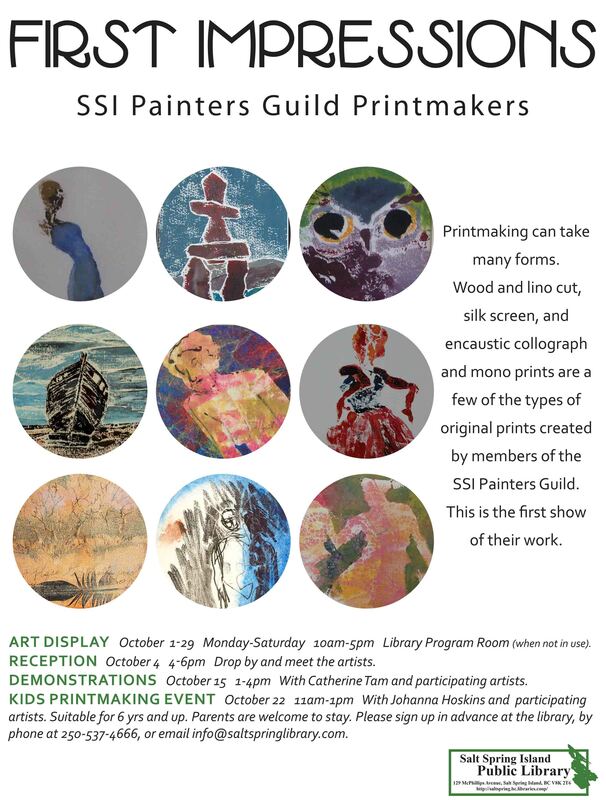 An Exhibition of New Prints from the Salt Spring Painters Guild’s Printmaking Group. 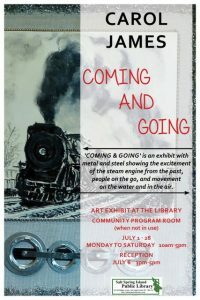 An exhibit with metal and steel, showing the excitement of the steam engine from the past, people on the go, and movement on the water and in the air. A Journey into the Minds of the People under the Stairs. 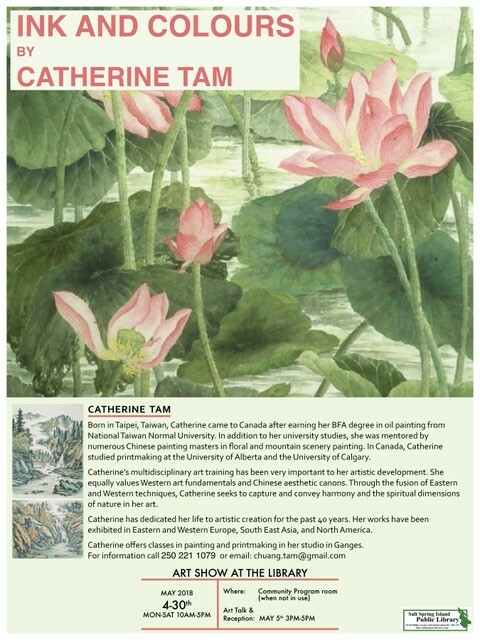 Catherine Tam will discuss traditional Chinese brush painting. Bob Fenske exhibits his street photography. 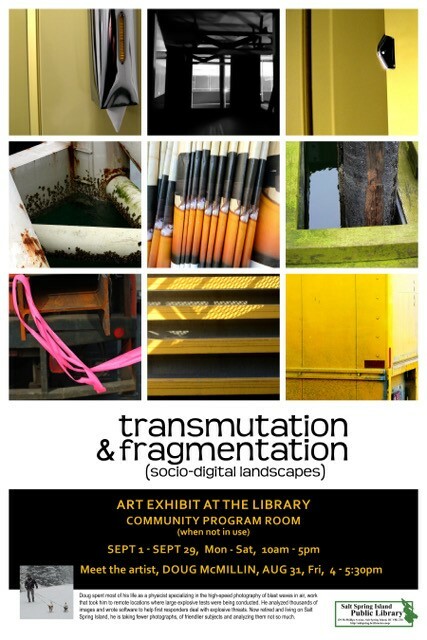 Multi-media artist Kristin invites you to an exhibition of artwork to be displayed in the Program Room of the Library. 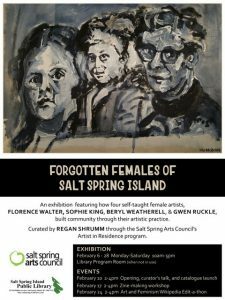 An exhibition featuring how four self-taught female artists, Florence Walter, Sophie King, Beryl Weatherell, and Gwen Ruckle, built community through their artistic practice. Curated by Regan Shrumm thorough the Salt Spring Arts Council’s Artist in Residence program. 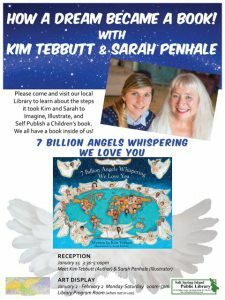 Learn about the steps it took Kim and Sarah to imagine, illustrate and self publish a children’s book. Volunteer and Community Resources wraps up Canada 150 with their exhibit. 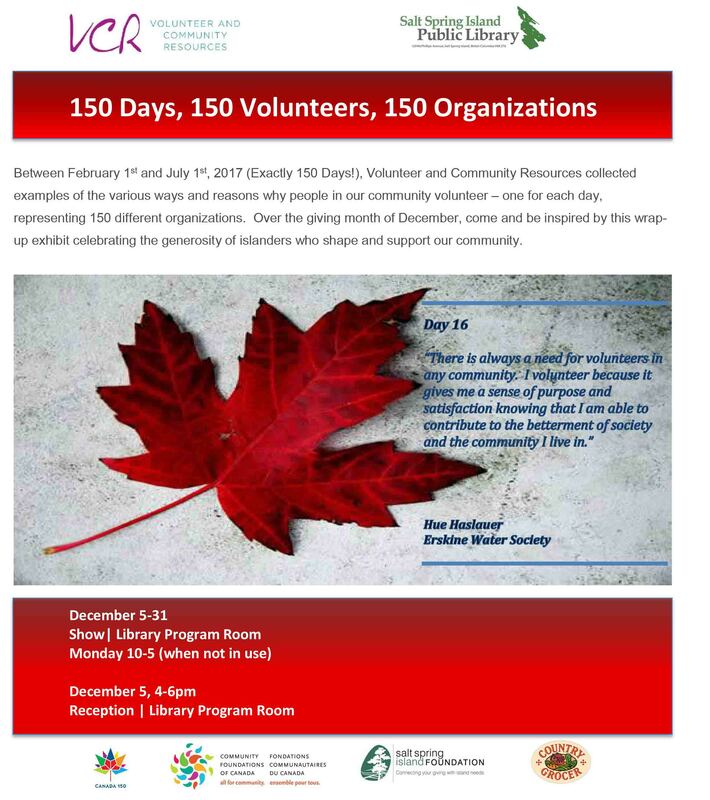 Come be inspired by examples of the various ways and reasons why people in our community volunteer. 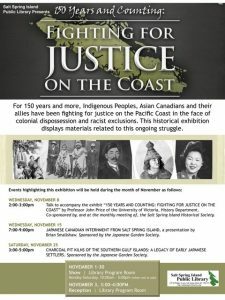 For 150 years and more, First Nations, Asian Canadians and their allies have been fighting for justice on the Pacific Coast in the face of colonial dispossession and racist exclusions. 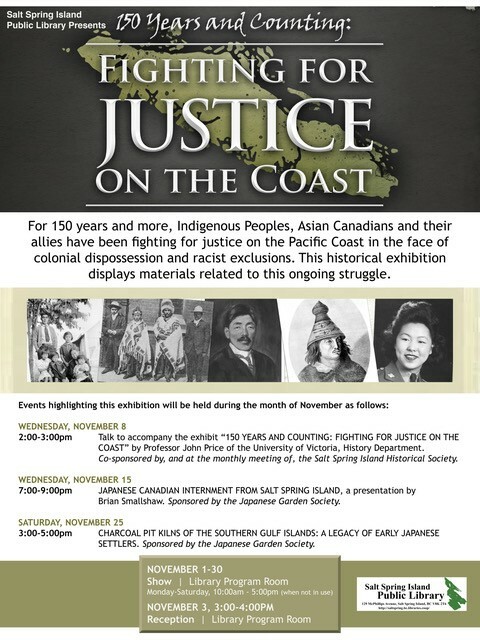 This historical exhibition displays materials related to this on-going struggle and was developed by Faculty Researchers, Tusa Shea and Imogene Lim as part of the ACVI Project headed by Professor John Price of the University of Victoria. 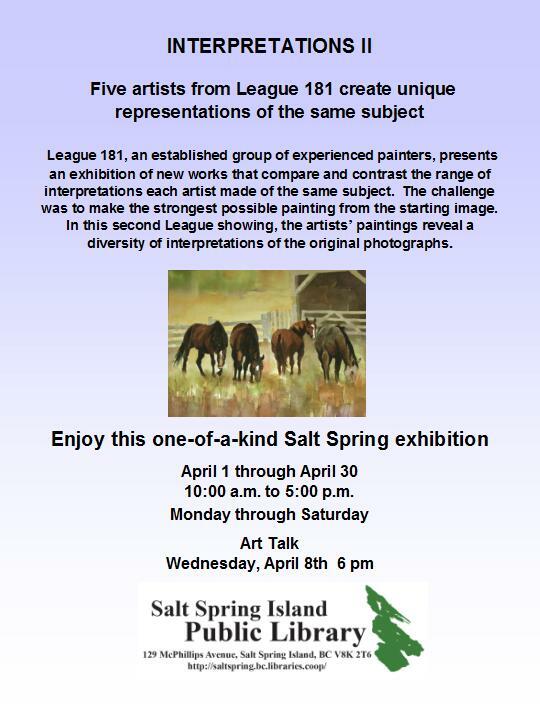 Come to the reception and meet the artists from the fringes of Salt Spring society. 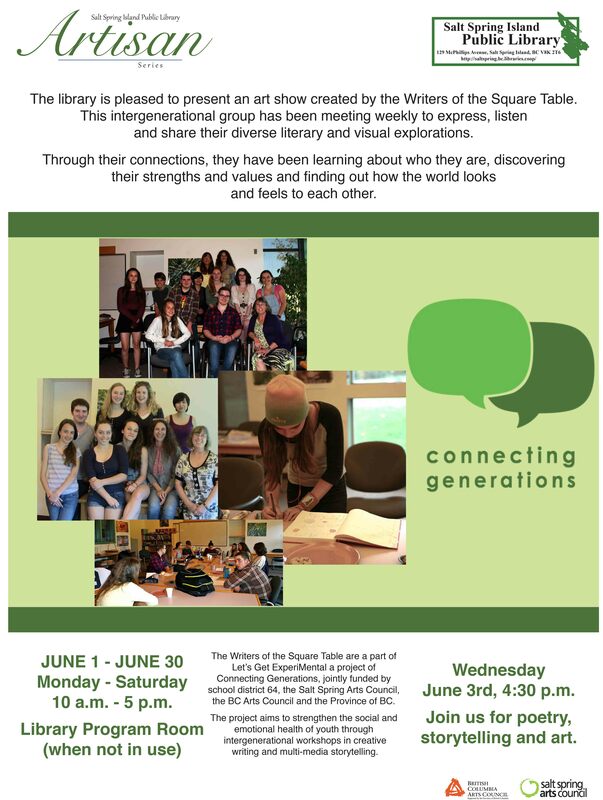 Appreciate the hidden talents of this eclectic and authentic group. Last year’s art sold quickly at the reception, so come early for best selection. All proceeds will go directly to artists. 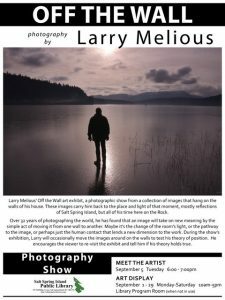 A photographic show from a collection of images that hang on the walls of his house. 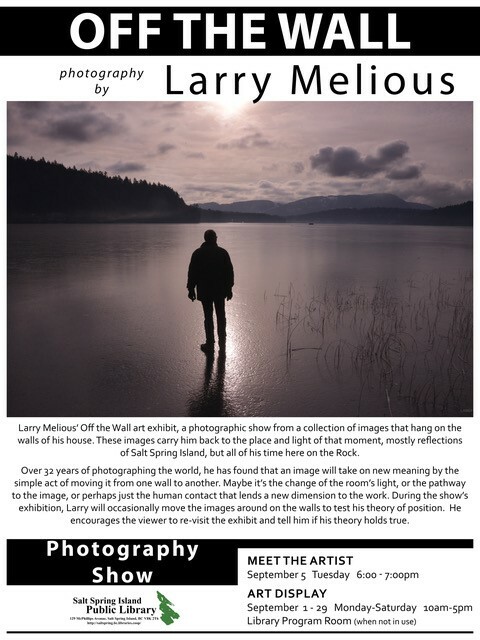 These images that carry him back to the place and light of that moment, mostly reflections of Salt Spring Island, but all of his time here on the Rock. 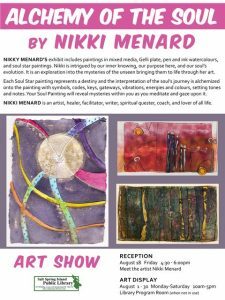 The exhibit includes mixed media, gelli plate, pen and ink watercolours and soul star paintings, which are on exhibit in August. 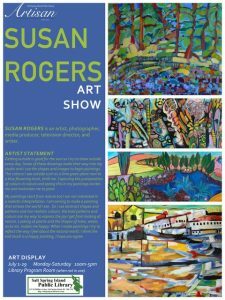 Susan Rogers is exhibiting her paintings during the month of July in the program room at the Salt Spring Library. One visitor to the exhibit commented, ‘the paintings are exuberant!’ Another person added, “they sizzle like summer.” Come and find out more about the process behind these bold joyful paintings. 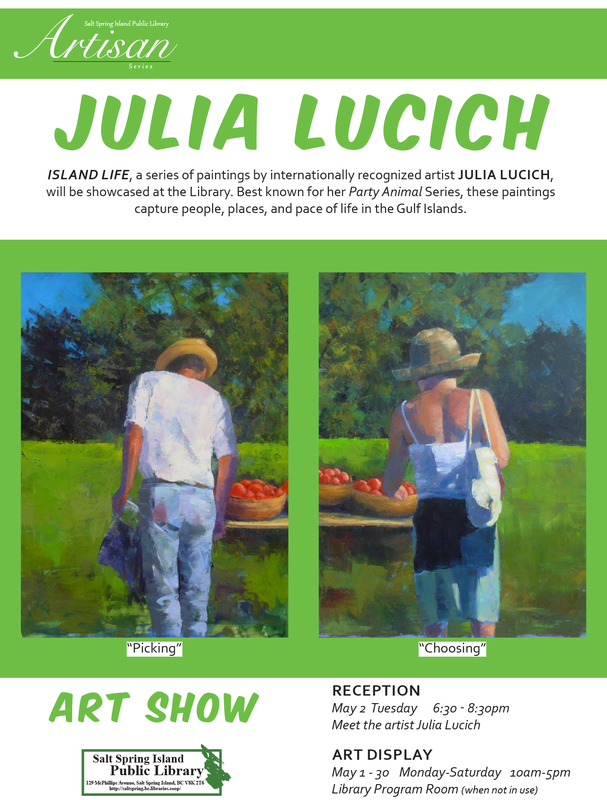 Julia Lucich’s paintings are on exhibit in May. Patricia Brown’s paintings are on exhibit in the Program Room in April. 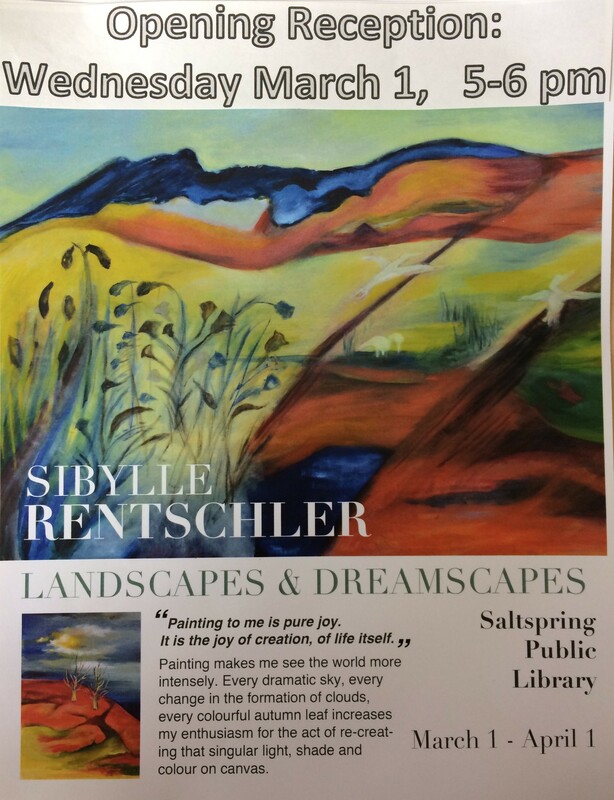 Sibylle Rentschler oil paintings are on exhibit in the Library Program Room March 1-31. 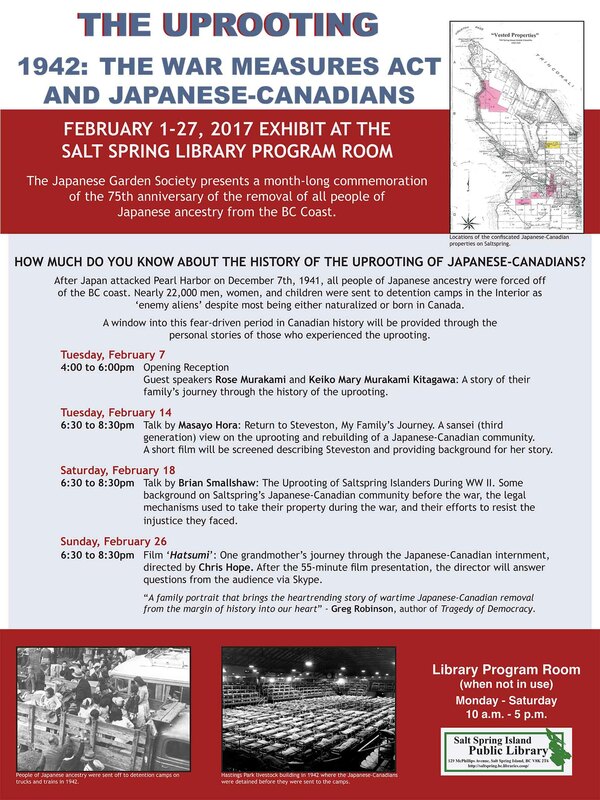 The Japanese Garden Society presents a month-long commemoration of the 75th anniversary of the removal of all people of Japanese ancestry from the BC Coast. These works of art are created with ink, from my imagination and without pencil contours or grids. 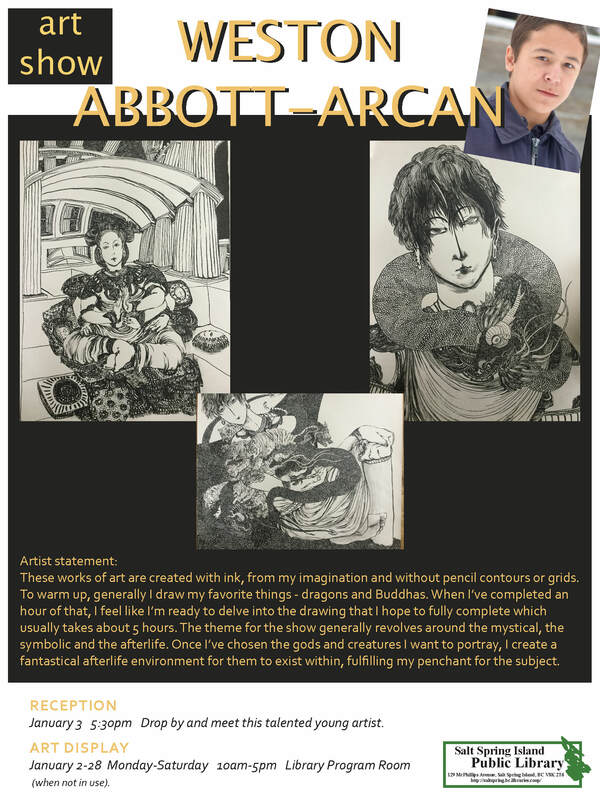 To warm up, generally I draw my favorite things – dragons and Buddhas. When I’ve completed an hour of that, I feel like I’m ready to delve into the drawing that I hope to fully complete which usually takes about 5 hours. The theme for the show generally revolves around the mystical, the symbolic and the afterlife. Once I’ve chosen the gods and creatures I want to portray, I create a fantastical afterlife environment for them to exist within, fulfilling my penchant for the subject. Sharing common of themes of transcendence and spirituality with her husband in both their works, Meade envisions the room filled with oil paintings, depicting trees, islands/coastlines, a car at dusk, and all the images that go along with her husband’s poems. 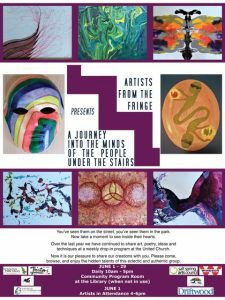 The two together this night will be presenting as a pair both the art and the poems. 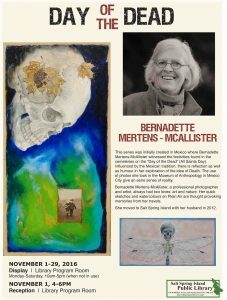 Local artist and photographer Bernadette Mertens-McAllister explores the idea of Death following the Mexican tradition, and in this work a touch of humour. 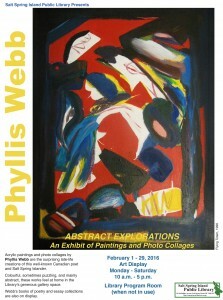 However, beyond the use of the bright colors and cheerful compositions, Mertens-McAllister goes deep into the subject. Facing the mystery of Death she invites the viewer to explore questions such as “How would you like to die?’ or “Is Death a gateway to the beyond or is it a transformation?” In this series, Bernadette has used a multimedia technique that she has developed over the years using acrylics and photos that are only her own. 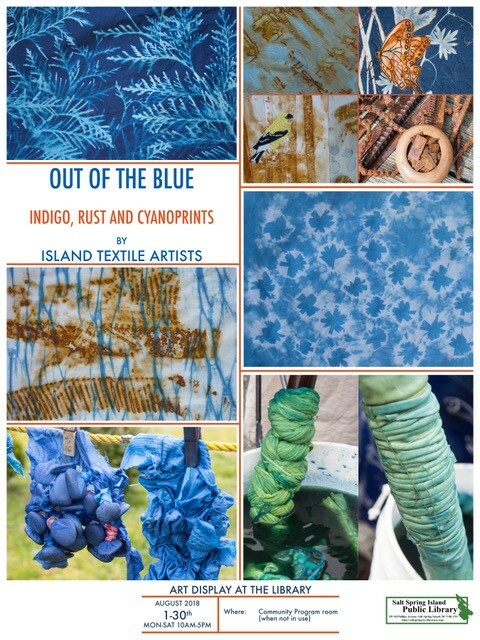 Printmaking can take many forms. 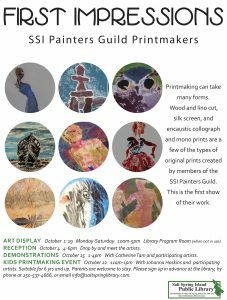 encaustic collograph and mono prints are a few of the types of original prints created by members of the SSI Painters Guild. 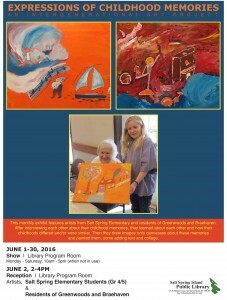 This is the first show of their work. 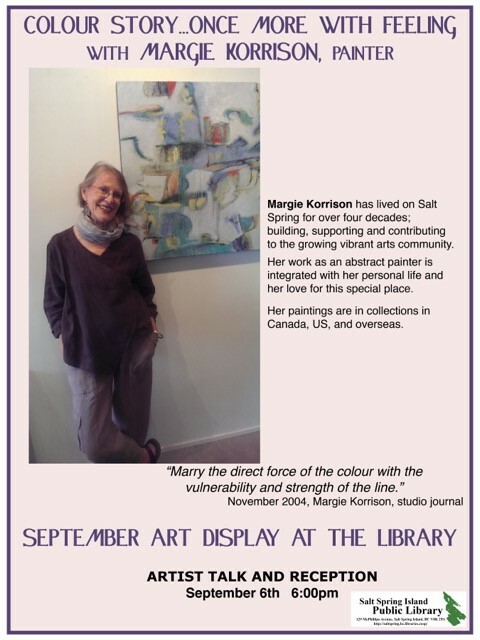 Margie Korrison has lived on Salt Spring for over 4 decades building, supporting and contributing to the growing vibrant arts community. 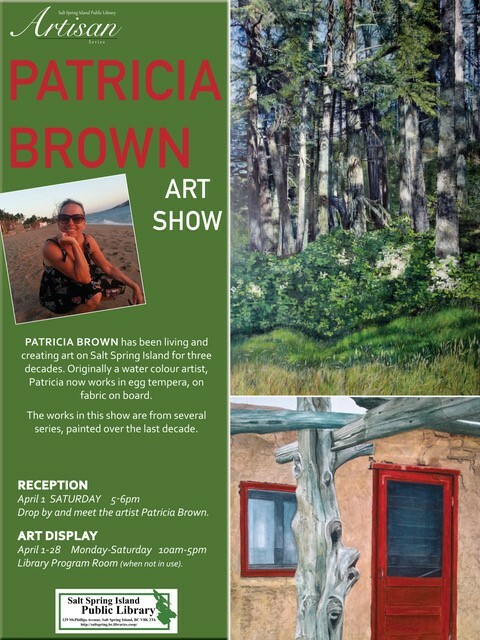 Her work as an abstract painter is integrated with her personal life and her love for this special place. Her painting are in collections in Canada, US, and overseas. Local artist Susan Gordon and Doug Wahlsten kick off a month long art exhibit of a collection of photos from their book, The Iridescent Silence of the Pacific Shores, and new paintings of light and spirit by Gordon. You’ve seen them on the street, you’ve seen them in the park. Now take a moment to see inside their hearts. 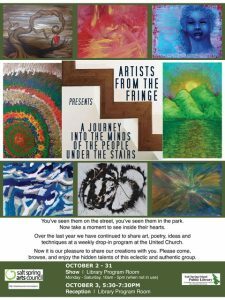 Over the winter months we have shared music, poetry, art, thoughts, and wisdom through a drop-in program at the United Church. 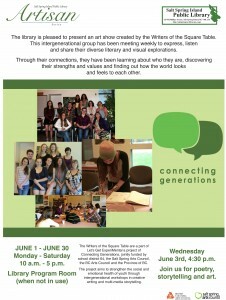 Now it is our pleasure to share this with you. 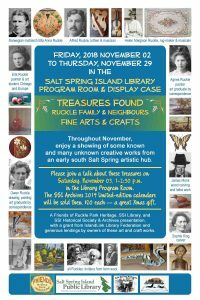 Please come, browse and enjoy the hidden talents from the fringes of Salt Spring society! 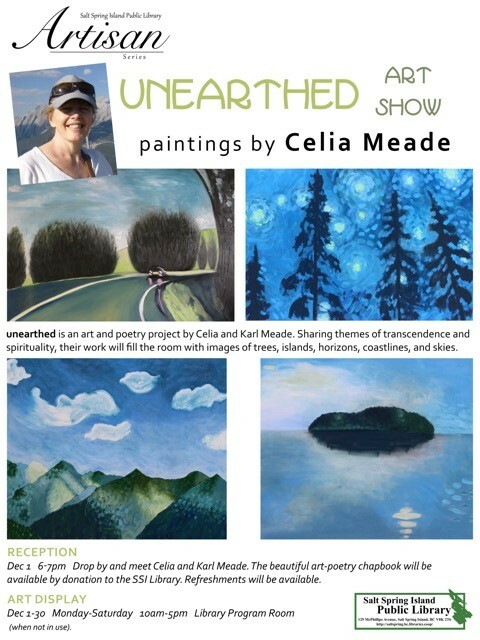 and painted them, some adding text and collage. 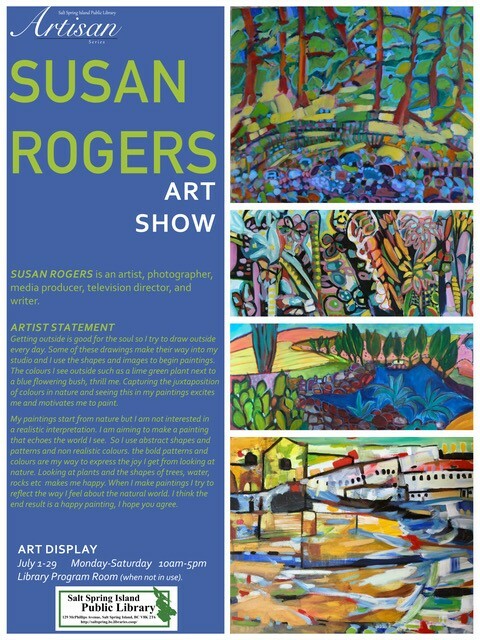 Each piece portrays intricate detail through the medium of gouache paint (opaque watercolour) and small, fine brushes. 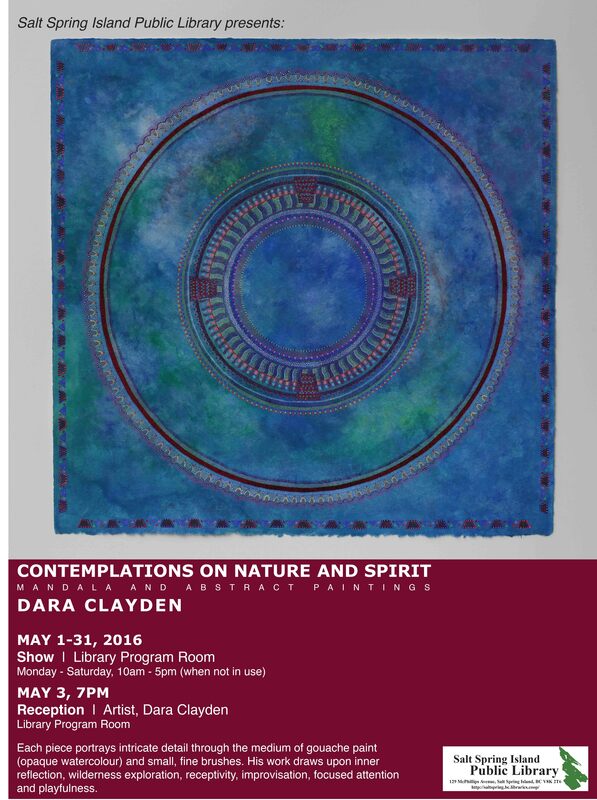 His work draws upon inner reflection, wilderness exploration, receptivity, improvisation, focused attention and playfulness. 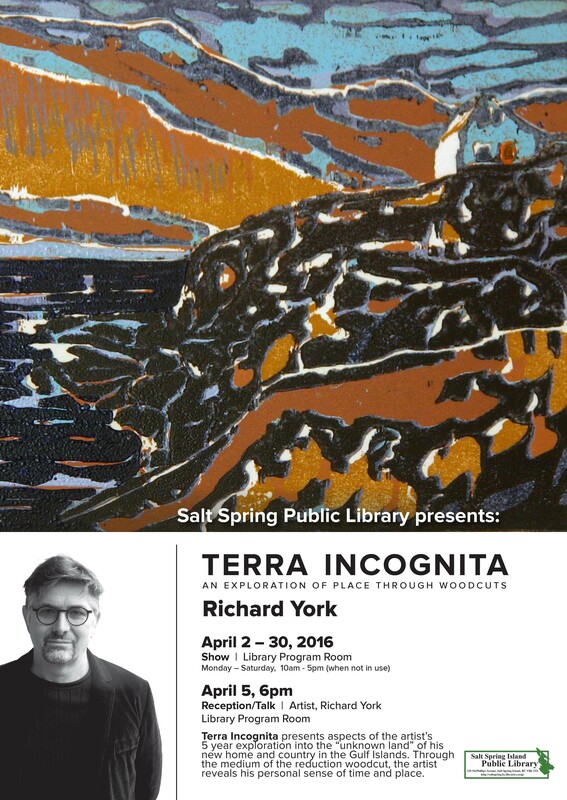 “Terra Incognita”, a reception/talk by Richard York introducing his April library exhibit. 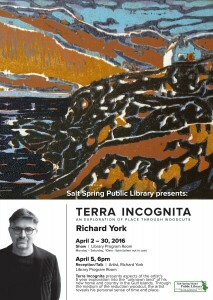 York will share his thoughts about his exploration of “sense of place” in his new-found home, using his chosen medium of woodblock printing. 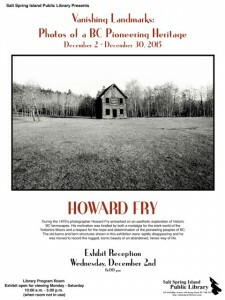 This landscape series, created in his Fulford studio during the past five years, includes prints which have found their way into private collections around the globe. 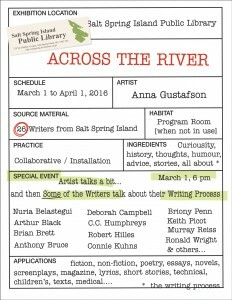 An art installation bridging the creative processes of writing and visual art, created by local artist Anna Gustafson. 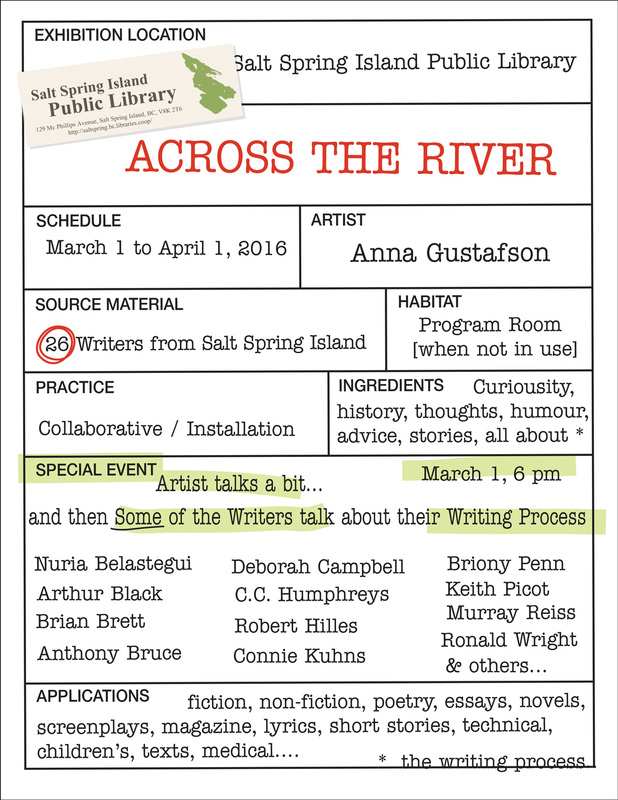 ‘Specimens’ present a window into the writing processes of over 20 Salt Spring writers, including Arthur Black, Brian Brett, Deborah Campbell, Michele Dunkerley, Robert Hilles, C.C. 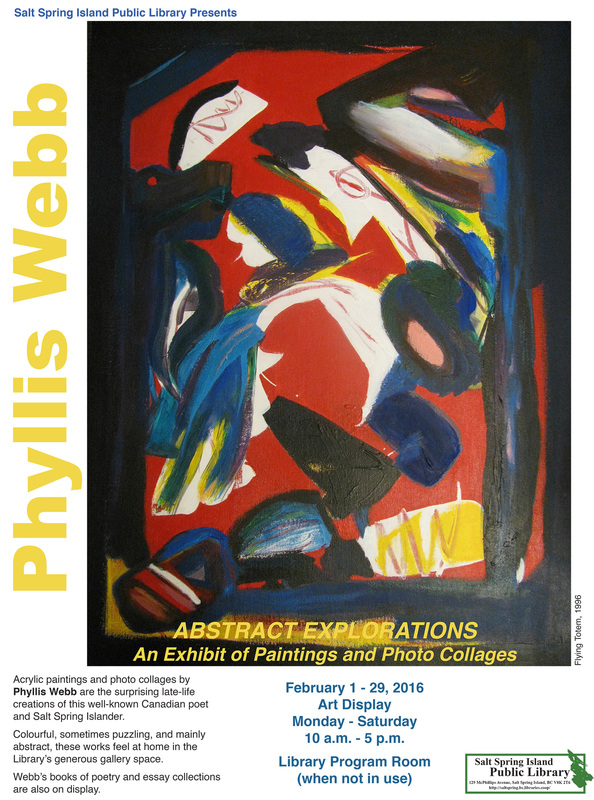 Humphreys, Connie Kuhns, Peter Levitt, Derek Lundy, Patrick Taylor, and Ronald Wright. abstract, these works feel at home in the Library’s generous gallery space. 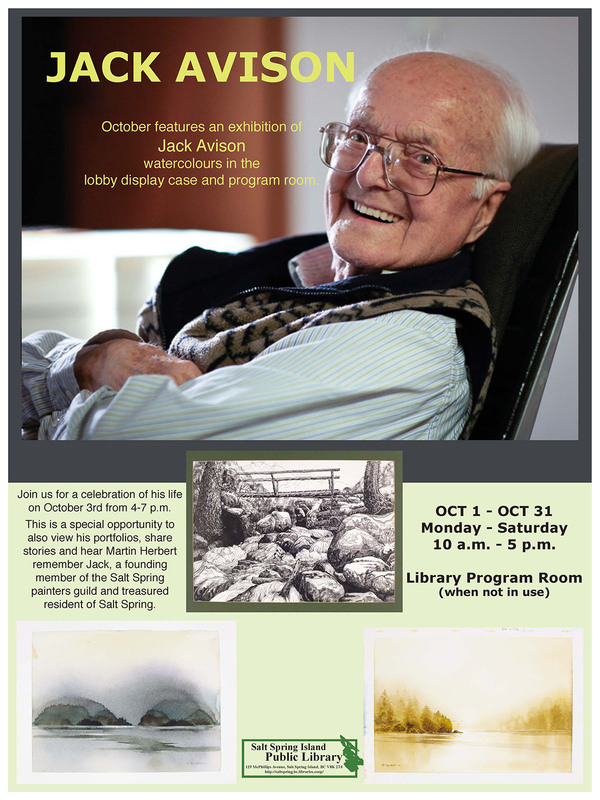 Webb’s books of poetry and essay collections are also on display. 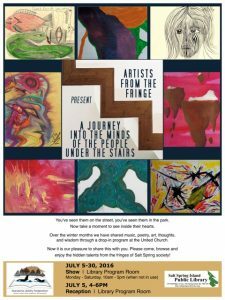 Salt Spring artists Frank Huether and Sandra Charge explore how music can guide the artist’s brush strokes. 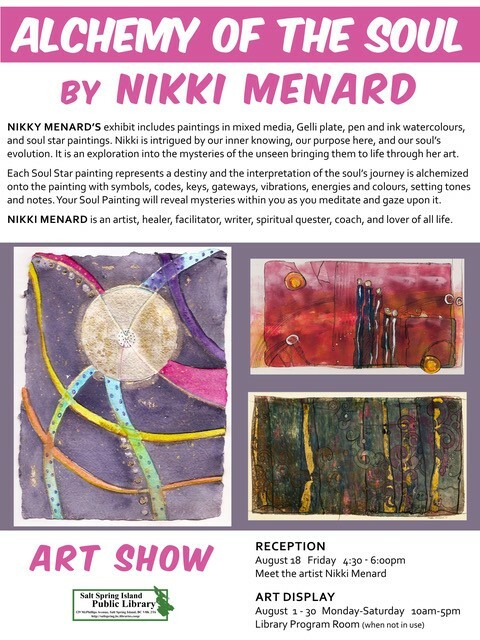 Whether it is the connection of music to colour or the provocation of music to emotion and movement, there is an underlying energy in sound that permeates into the senses. 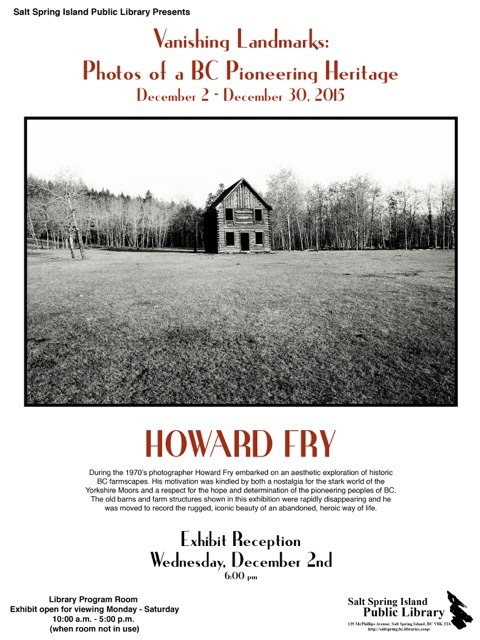 Art reception featuring photographer Howard Fry who will be present to discuss when he embarked on an aesthetic exploration of historic BC farmscapes in the 1970’s. His motivation was kindled by both a nostalgia for the stark world of the Yorkshire moors and a respect for the hope and determination of the pioneering peoples of BC. The old barns and farm structures shown in this exhibition were rapidly disappearing and he was moved to record the rugged, iconic beauty of an abandoned, heroic way of life. Stories of Grace Islet exhibit opening with a talk by Joe Akerman, other speakers and songs. 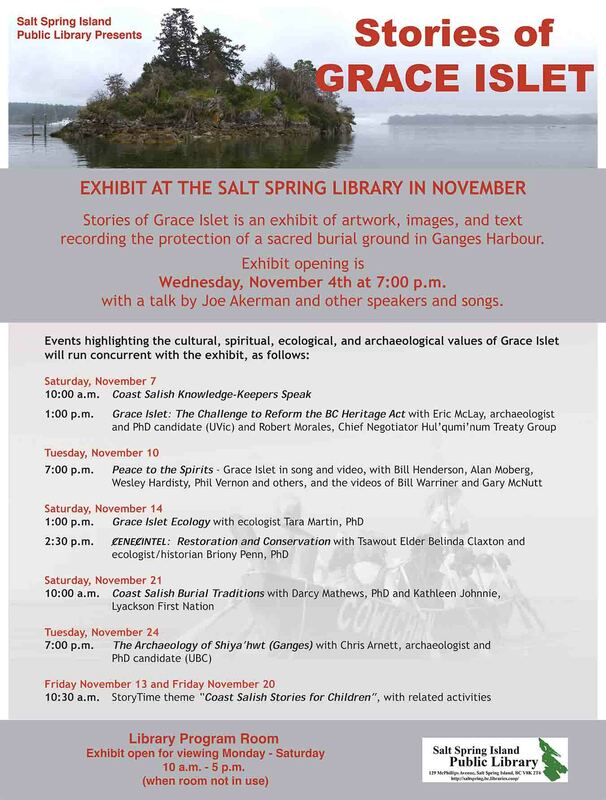 An exhibit of artwork, images and text recording the protection of a sacred burial ground in Ganges Harbour. An exhibition of work by GISS students and Salt Spring artists that incorporates charcoal excavated from 100 year-old kilns on Salt Spring Island. 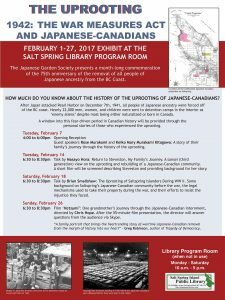 Also included are photographs of the kiln excavation project and information about this legacy left by early Japanese settlers. 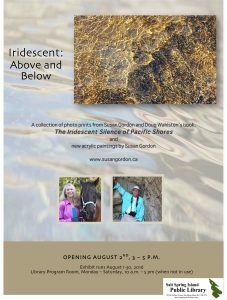 A new photo-based exhibit by Greg Klassen. 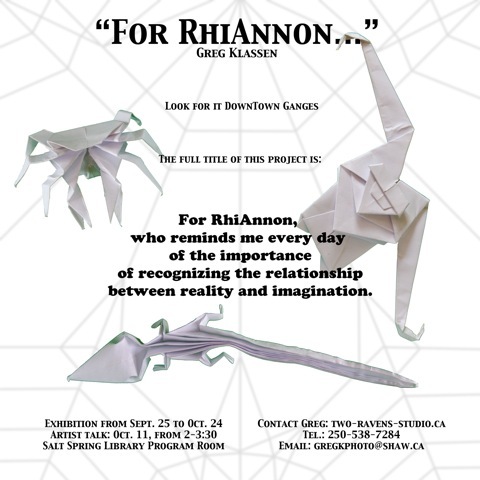 The full title of this project is “For Rhiannon, who reminds me every day of the importance of recognizing the relationship between reality and imagination”. 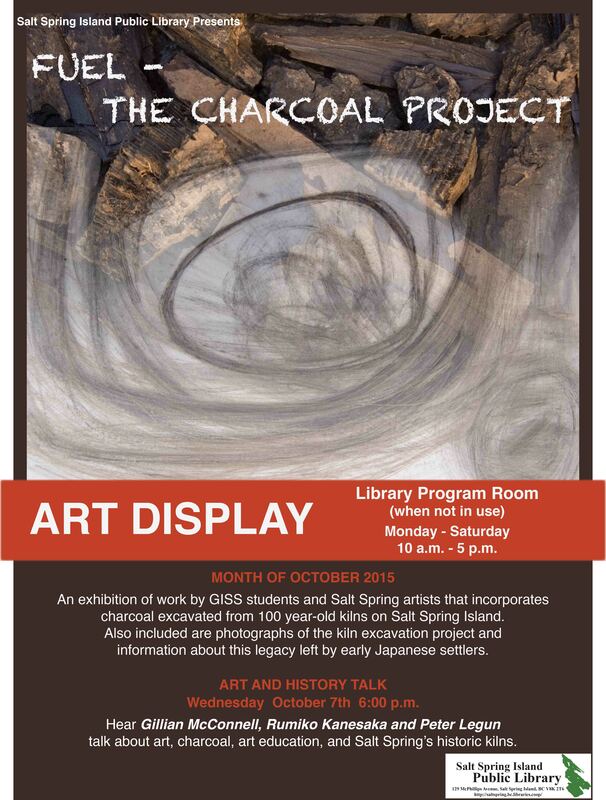 Exhibition is outside the library September 25 – October 24. A reading by Bill Brownridge, author of four Canadian classic children’s books (The Moccasin Goalie) relating to hockey and “Tracking the Iron Horse” – a tribute to railway pioneers. His paintings are available in three Canadian galleries, and the U.S. Olympic Centre in Colorado. 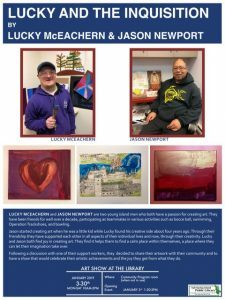 He has exhibited in Toronto’s Hockey Hall of Fame, and appeared in newspapers across Canada, in magazines, and on CBC Radio and CBC TV. 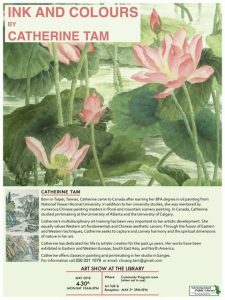 His works were also commissioned as a part of Calgary’s winning presentation to the International Olympic Committee for the 1988 Olympics. 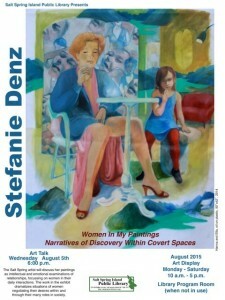 Hear Stefanie Denz’ talk on “Women in my paintings; narratives of discovery within covert spaces”. 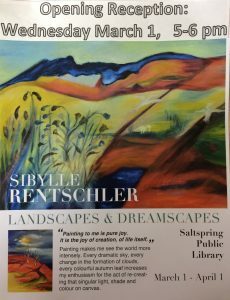 The Salt Spring artist will discuss her paintings as intellectual and emotional examinations of relationships, focusing on women in their daily interactions. The work in the exhibit dramatizes situations of women negotiating their desires within and through their many roles in society. 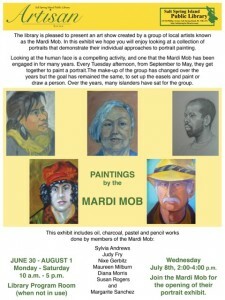 Join the Mardi Mob for the opening of their portrait exhibit. 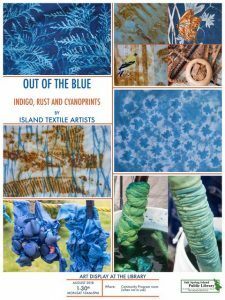 For many years this group have been getting together to paint portraits of islanders. 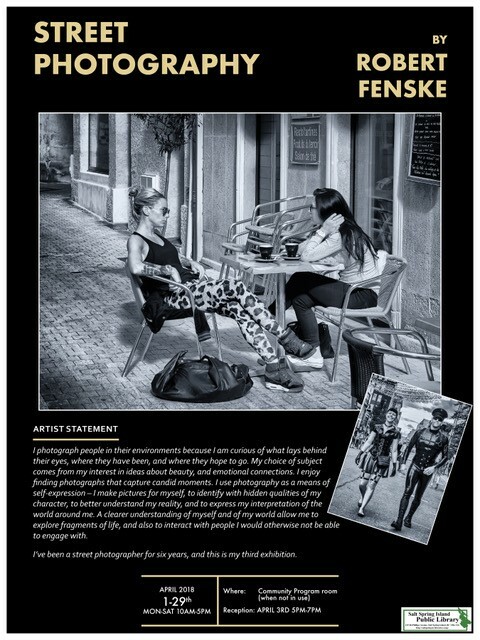 You will see how each artist uses their chosen medium to express their own approach to the art of portraiture. 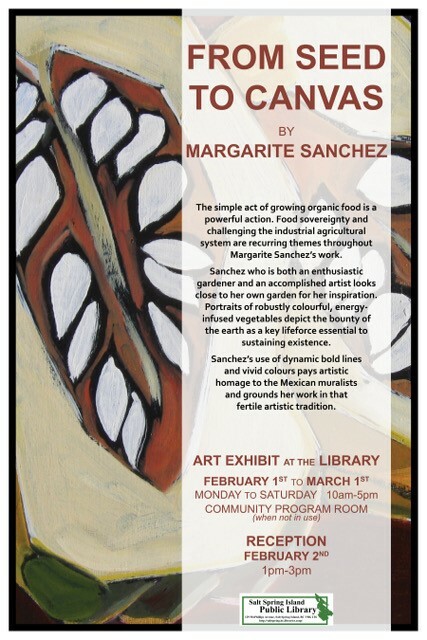 This exhibit includes oil, charcoal, pastel and pencil works done by the eight members of the Mardi Mob: Sylvia Andrews, Rosamonde Dupuy, Nixe Gerbiz, Judy Fry, Maureen Milburn, Diana Morris, Margarite Sanchez, and Susan Rogers. A show of writings and artwork which is the culmination of Let’s Get ExperiMental, a project whose aim is to strengthen the social and emotional health of youth through intergenerational workshops in creative writing and multi-media storytelling, the anthology to be published later this year. 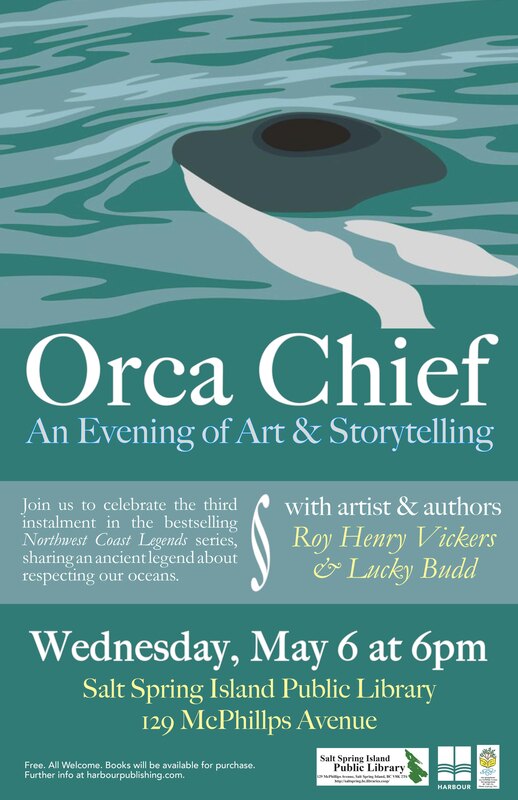 Join artist Roy Henry Vickers & author Lucky Budd for an evening of storytelling and art, to celebrate the third installment in the bestselling Northwest Coast Legends series. 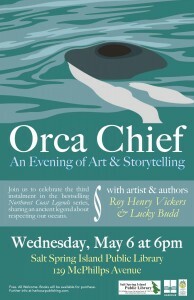 Orca Chief shares an ancient fable about respecting our oceans. 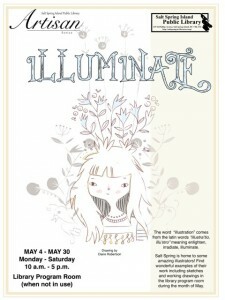 The word “illustration” comes from the latin words “illustra’tio, illu’stro” meaning enlighten, irradiate, illuminate. 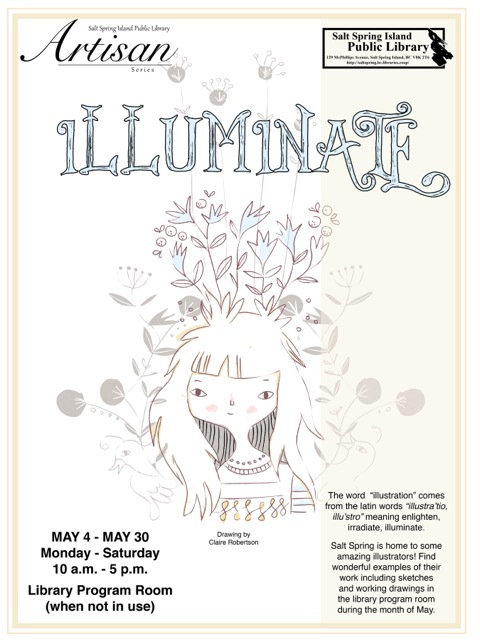 Salt Spring is home to some amazing illustrators! 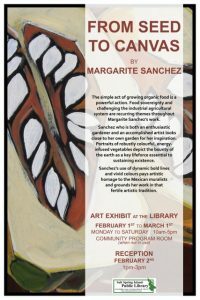 Find wonderful examples of their work including sketches and working drawings in the library program room during the month of May. 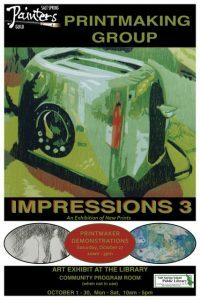 Five artists from the painters group League 181, an established group of experienced painters, presents an exhibition of new works that compare and contrast the range of interpretations each artist made of the same subject. 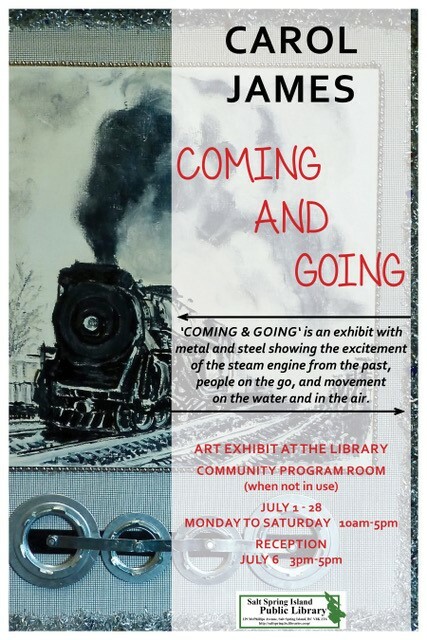 The current show in the library program room running from April 1 to 30 with a public talk on April 8 at 6:00 pm illustrates the diversity of work emerging from round two. Come and discover the creative cousins of the common drinking glass, serving bowl and window pane that are the essence of contemporary art glass. 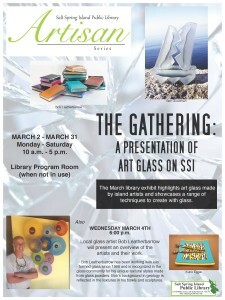 This presentation by local glass artist Bob Leatherbarrow showcases the wide range of techniques used to design and create with glass by highlighting exciting work by Salt Spring glass artists. Ronald T. Crawford’s artwork reflects both the theoretical and physical aspects of his life. 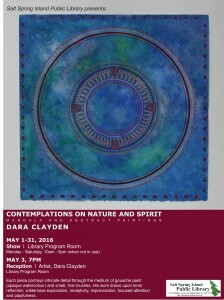 His multifaceted work is the result of the blending of contemporary painting concerns with the earthy spiritualism of stone. Interpretive photographs by David Borrowman, Eric Klemm, Sam Lightman and Theresa Mackey of these intriguing and engaging “Babas”, a sculptural installation at Salt Spring’s Stonehouse Bed and Breakfast, will be in the program room for the month of February. 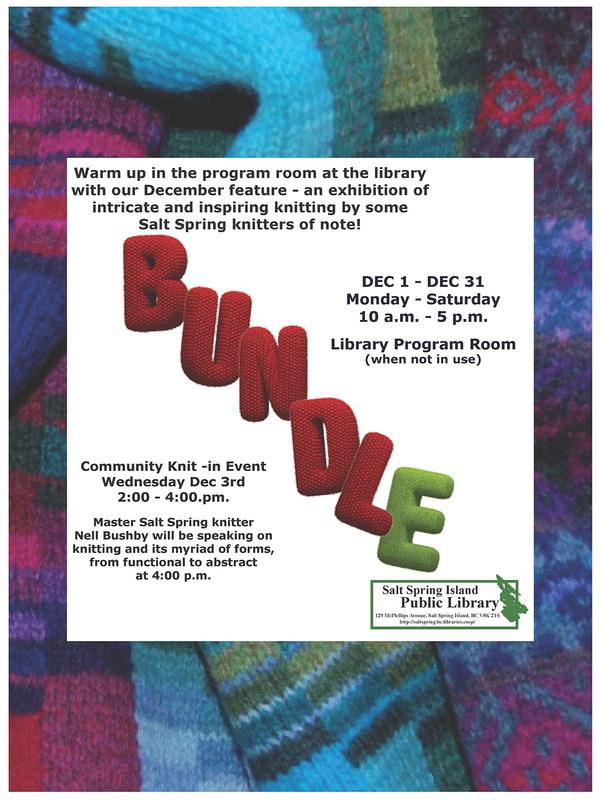 Warm up in the Program Room at the library with our December feature – an exhibition of intricate and inspiring knitting by some Salt Spring knitters of note. 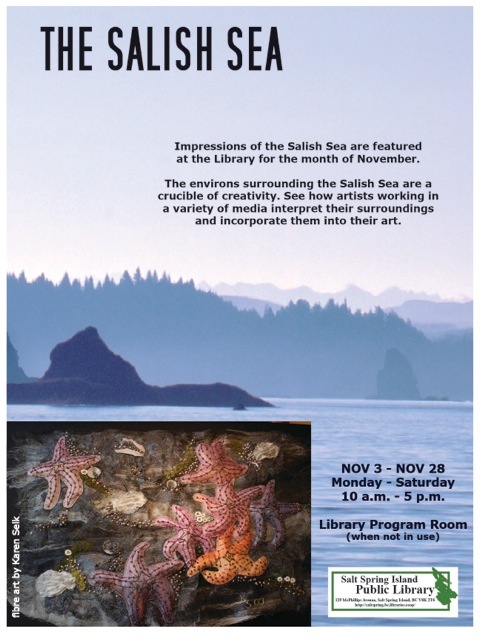 The environs surrounding the Salish Sea are a crucible of creativity. 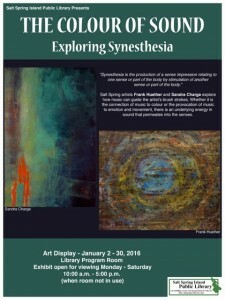 See how artists working in a variety of media interpret their surroundings and incorporate them into their art. 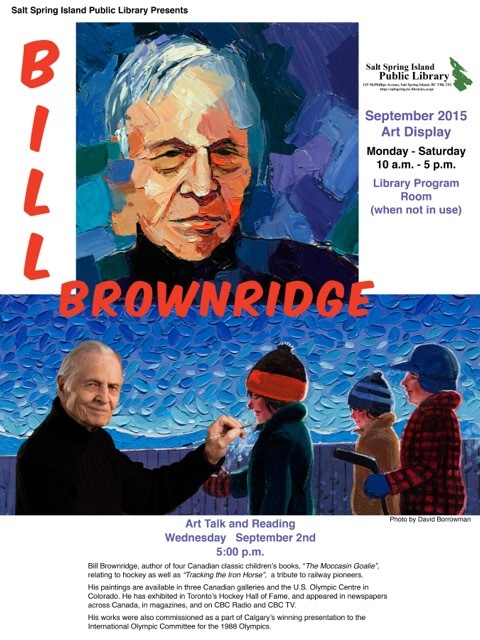 Join us for a celebration of his life on October 3rd from 4-7pm. 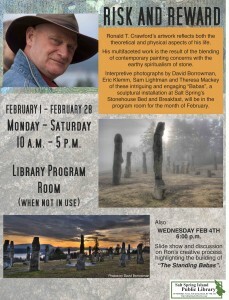 This is a special opportunity to also view his portfolios, share stories and hear Martin Herbert remember Jack, a found member of the Salt Spring painters guild and treasured resident of Salt Spring. Put together an artist who loves words and a writer who thinks in imagery and the conversation is bound to be lively! 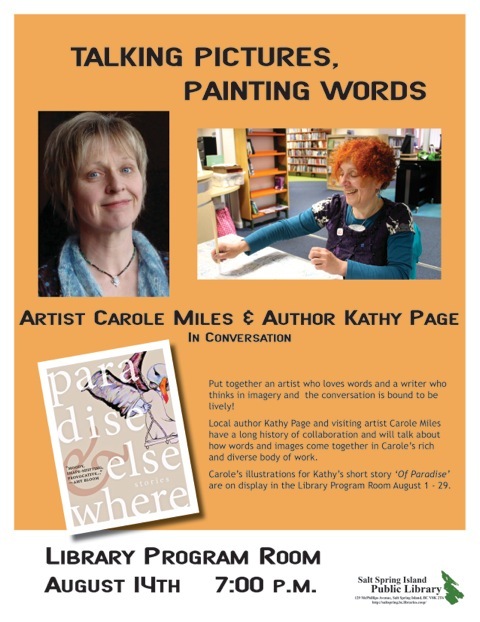 Local author Kathy Page and visiting artist Carole Miles have a long history of collaboration and will talk about how words and images come together in Carole’s rich and diverse body of work. 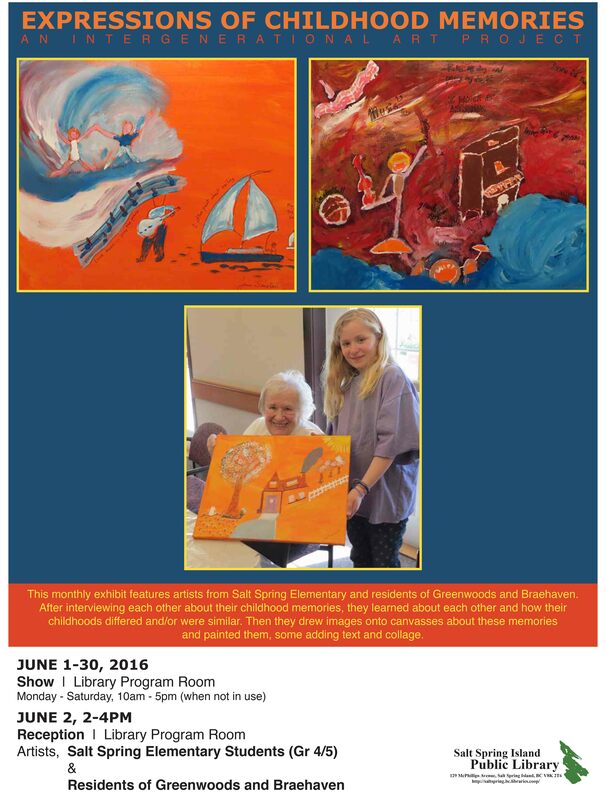 Carole’s illustrations for Kathy’s short story ‘Of Paradise’ are on display in the Library Program Room August 1 – 29.